The current war in Syria has reduced entire cities to rubble and destroyed many of the country’s historic treasures. Apart from the destruction, entire industries and handicraft traditions are in danger of extinction. Many of these handicraft traditions, which have been passed down through generations, cannot be learned at schools or academies. Several industries have already died or are on the verge of collapsing completely, and their masters have either been displaced or fled the country, as most were based in the Syrian countryside, which has been up in flames since 2011. One of the industries in danger is swordmaking, for which the Damascenes were once internationally renowned. Essential in Arab and Muslim history, swords are also a main component of decoration, warfare, weddings and literature. Historically, the craft has been passed down from father to son in small workshops, held behind the grand Umayyad Mosque in Damascus. The firmer the sword and the sharper its blade, the higher the credentials of the swordmaker become. The craft faces serious challenges today as market demand is in constant decline for good swords. They are useless in battle and no longer compatible with modern furniture and homes, making them less attractive to a new generation of customers. “We sell them occasionally — perhaps one or two a year” said Abu Al Huda, an antique dealer in Bab Sharki, one of the seven gates of the Old City. “Before the war started we used to sell authentic swords to Arab tourists, namely from the Gulf.” “The tourists are gone,” he says, while gazing at the empty market surrounding him. Many shop owners have had their shops destroyed by the ongoing war and others have switched their business to something more profitable — like fixing smartphones. The number of families who specialise in the craft have shrunk as many have fled the country as refugees. The fewer sword craftsmen, the fewer people left to pass down the secrets of how to make the handicraft. “Two or three people still make swords on demand, but the rest have long left the business,” Abu Shafiq Al Khatib, a retired 81-year-old swordmaker in Damascus, told Gulf News. Sword-making flourished in Damascus under the Umayyad Dynasty, from 661 to 744, and was transported to Baghdad in 750. Even before the birth of Islam, Syrians knew how to hammer out iron and steel, making straight, broad, double-edged swords. Some were used for battle, others for personal safety against caravan pirates and external invasions. The Roman Emperor Diocletian (284-305) even set up a weapons factory in Damascus, because Damascene craftsmen were known for their skill in handling and shaping iron. Later, during the Islamic conquest, sword and dagger-making developed considerably. 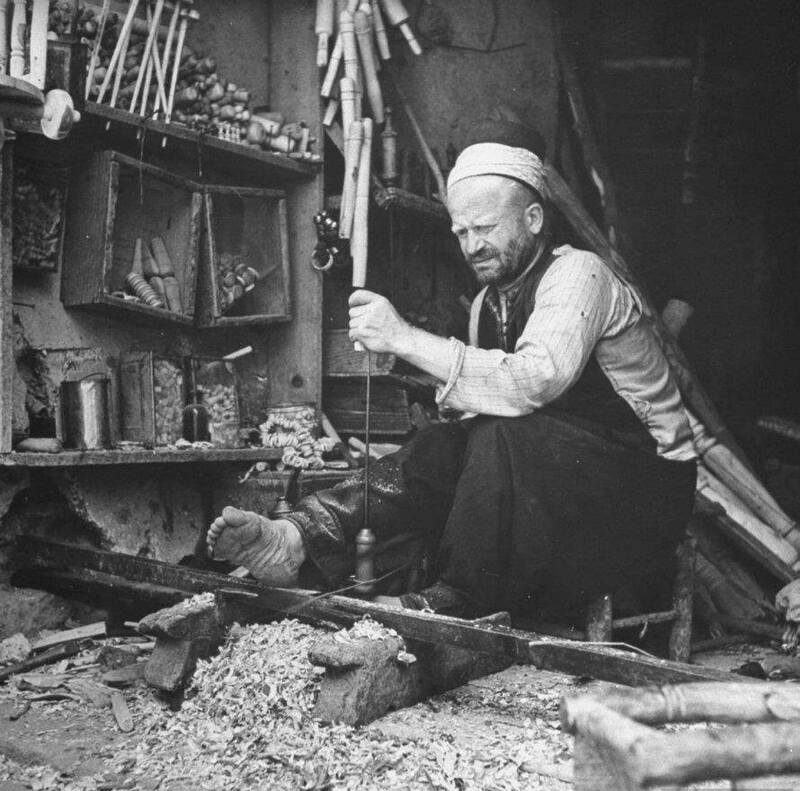 Al Sioufi, or sword-maker in Arabic, is the name of a large and illustrious family in Damascus, specialised in sword-making for generations. Some swords are longer than others and length depends on the maker and the customer. Generally speaking, however, a blade is 75-90cm long; the sheath is 85cm long, and the grip is 15cm in length. For folkloric purposes, some swords are aged and darkened, to make them look ancient. Blades are decorated with designs and Arabic calligraphy. Sometimes if the sword is intended as a special gift, precious stones are added to it. As for decoration and engravings on swords and daggers, some craftsmen excel in refining their products and are creative in the decorations; they engrave and use gold or silver threads to inlay the blades in the form of geometric shapes, other figures, a Quran, proverb, or verse quotations. The decorations also go on sword grips and sheaths. Shells, bone, ivory and tin are used in these decorations. Another endangered industry is glass-blowing, a former treasure of Damascus that was exported to Italy and inspired the making of Murano glass. Blown glass is made either from pieces of broken glass or sand. Broken glass is collected by the craftsmen themselves, who melt them down and reproduce them into new colourful items like cups, saucers and pitchers. The sand glass factory of Damascus is located in Dummar, a large suburb-turned-neighbourhood northwest of the Syrian capital. Glass blowing begins with dipping a hollow metal blowpipe, 120-150-centimeters long, into molten glass. Some of it sticks to the end of the pear-like blowpipe, and the worker begins to blow gently into the blowpipe, forming a bubble into its desired shape. The glass can be squeezed, stretched, curled and cut, depending on the end-product. Manual glass blowing is characterised by the absence of ready-made molds, allowing workers to give the produced glass various shapes, depending on their skill and requirements of the end user, says Abu Ahmad Al Sabbagh, a professional glass-blower, who complained to Gulf News that most masters of the trade left to Turkey after violence erupted in 2011. Scarcity of experts is a problem, he explains, and so are machine-made products that sell for competitive prices, coming-in from China. “Nowadays, it is more of a hobby than a profession for young people” he adds. Third on the list of endangered products is the Damascene Brocade, or natural silk textiles. Some are made with gold and silver threads and images of birds and deer, traditionally in seven colours, and also include almonds, hazelnuts, diamonds, and jasmines motifs. Each drawing has a specific number of warps, ranging from 4,000 up to 10,000 threads. Brocade is used to make women’s clothes, scarves, waist bands of traditional costumes, neckties, and both fancy furniture and expensive drapery. Brocade is generally associated with luxury and opulence, once reserved for the old palaces of Damascus. For centuries, Damascene families have established themselves as kings of the trade, like the Naasans, the Nuqtas, the Mzannars, Al Shkakis and the Mtinis. The secrets of the trade, and all its skills, are passed down from one generation to the next by word of mouth, says Mohammad Sawwah, a Damascus industrialist and president of the Syrian Exporters Federation. Damascene Brocade has not changed with the passing of time — it is still produced in the same manner as it started five centuries ago but only two looms are still standing due to the current war in Syria. “Fifteen are still present in Damascus but they need to be repaired” adds Sawwah to Gulf News. Workers are required to spend up to ten hours non-stop behind the loom to weave just one metre of material. Workers take turns at a loom, with day and night shifts. A physical mark is left behind by each to indicate the number of metres achieved by each worker. Patience is a must for all Brocade-makers. Brocade manufacturing is constantly threatened by shortage of raw material and an experienced labour force, explaining why more than any other textile industry, it is currently endangered and started to become less common in Damascus, despite all of its history. The trade is difficult to learn and master, explaining why many have abandoned it willingly. The crux of production, being natural silk for brocade weaving, is made from silkworm caterpillars in the Syrian coast. Transportation is currently difficult from one city to another, due to checkpoints and war-zones, and silkworm cultivating is in decline, thereby directly affected Brocade-making. Another difficulty is the slow pace of production when compared to other forms of mechanised textile manufacturing. It takes fifteen hours, for example, to produce just 1.5 metre’s using a single machine, administered manually by its workers. Additionally, Damascene Brocade is demode in modern homes and furniture, making it more profitable for exportation and tourist consumption. Both are liable to decline in times of war and crisis.